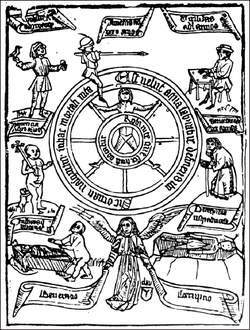 The medieval Wheel of Life with the five Ages of Man: child, young man, mid-life, older, and senescent. Reproduced by permission of Fortean Picture Library. The Ages of Man refers to the ancient notion that the different stages of human life are ruled by different planets and the luminaries (i.e., the Sun and the Moon). The traditional schema was as follows: Moon—growth (ages 1–4); Mercury—education (5–14); Venus—emotion (15–22); Sun—virility (23–42); Mars—ambition (43–57); Jupiter—reflection (58–69); and Saturn—resignation (70–99).